Is Hyperinflation Associated only with Revolutionary New Governments? 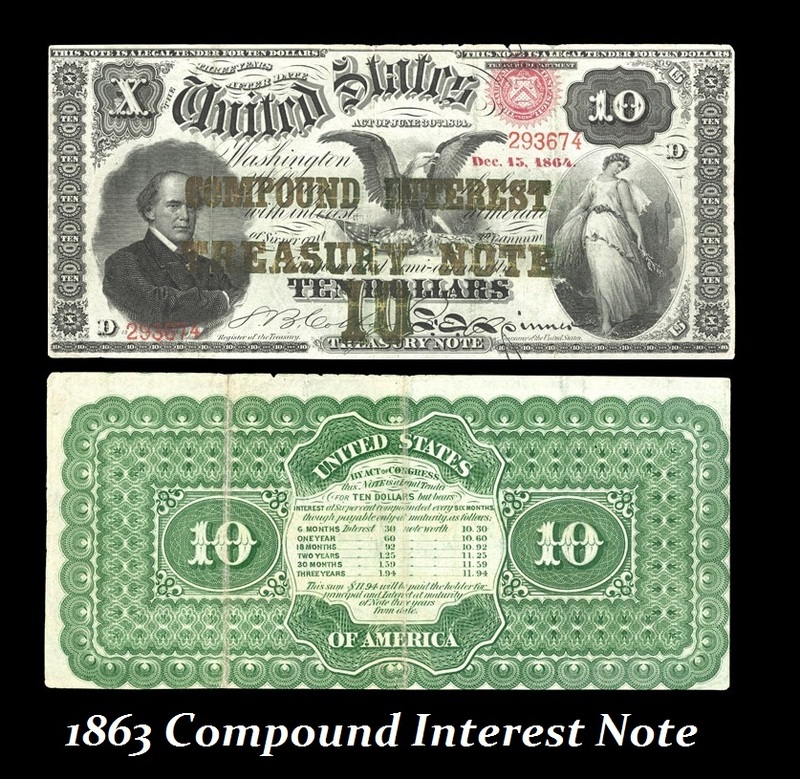 QUESTION: I have done my own homework and it appears you are correct regarding monetary history and that simply because a currency is “fiat” does not result in hyperinflation, Even the Greenback of the US Civil War did not result in hyperinflation. Is it correct to say then that hyperinflation takes place only with revolutionary new governments? ANSWER: To be precise, hyperinflation takes place when there is a collapse in confidence that supports a government so it can be an established government such as in South America. The key is the currency is not accepted by the people. That comes FIRST and then we see that they print more and more following the trend and propelling it. This is the chicken or egg dilemma. It is not the REVERSE that the supply increases and that causes the currency to decline as characterized by the gold promoters. 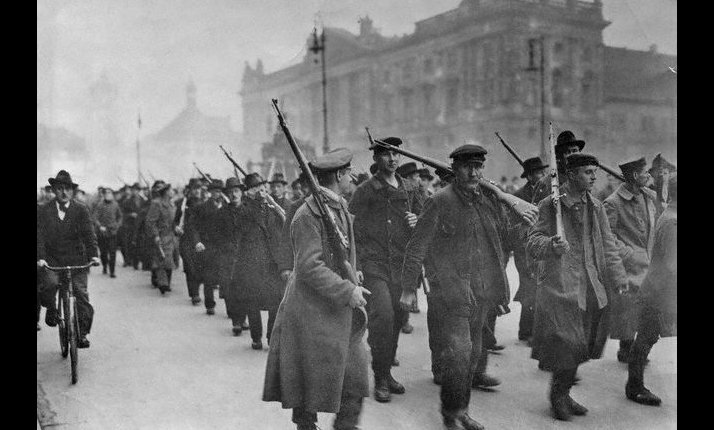 Hyperinflation unfolds when the people no longer trust the government and that can occur with an established government as in South America without war, but it is traditionally associated with revolution such as the American colonies during the American Revolution, French Revolution, German 1918 Communist Revolution, Russian Revolution, Hungary etc. We can see that inflation was about 827% in Massachusetts over the course of almost 52 years or one ECM cycle up until 1749 well before the Revolution. We are beating that rate today but it is still not hyperinflation. Confidence has not abandoned the dollar and cannot. There is simply no other place to put BIG CAPITAL internationally – Yuan, Yen, or the Euro. Technically, hyperinflation did not truly unfold in the American colonies. There still remained the basic core of confidence in the governments, albeit their currencies varied widely. But keep in mind that currency at this time was in reality circulating bonds. 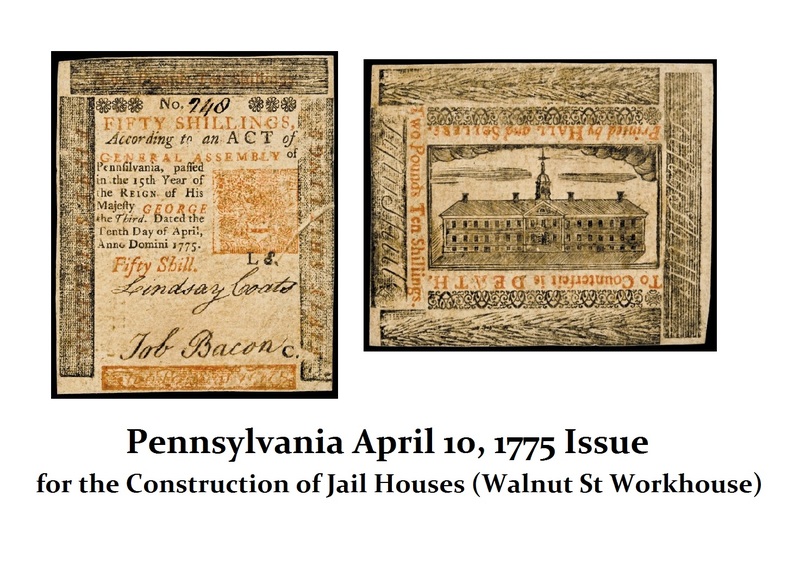 Pennsylvania issued notes to fund the construction of specific projects such as jails and lighthouses. Therefore, simply touting that “fiat” produces hyperinflation has no historical foundation whatsoever. For every example of hyperinflation such as in Germany, I can provide 20 showing the opposite. You do not see hyperinflation in Britain or China despite the fact that both declined from major economic peaks. Money never becomes worthless in a major core society for if the core were to collapse then everything else must fall as well. Genghis Khan accepted the paper currency of China upon his conquest and did not render it worthless. It continued to circulate and he accepted it in payment himself. That is showing the Moguls wanted the dignity of conquering civilization and merely replaced the emperor. Human nature does not change with time. It remains consistent and this is why history repeats. With the fall of Rome, the invading barbarians wanted to be Roman. Their rulers initially issued coins merely pretending to be the emperor. 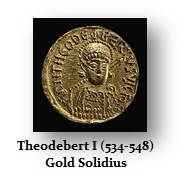 One of the great kings was Theodebert I (534-548AD) whose tomb is erected and still standing as if he too had been a Roman Emperor. Thus the invaders wanted to be the head of the civilization both in China and Europe showing confidence did not vanish, just a change in ownership and no hyperinflation. I am not selling anything so I have no ax to grind. It is what it is – always without exception. Solomon Brothers use to put out bond forecasting and that was highly regarded until the people began to notice they would put out a buy signal and they were the sellers. 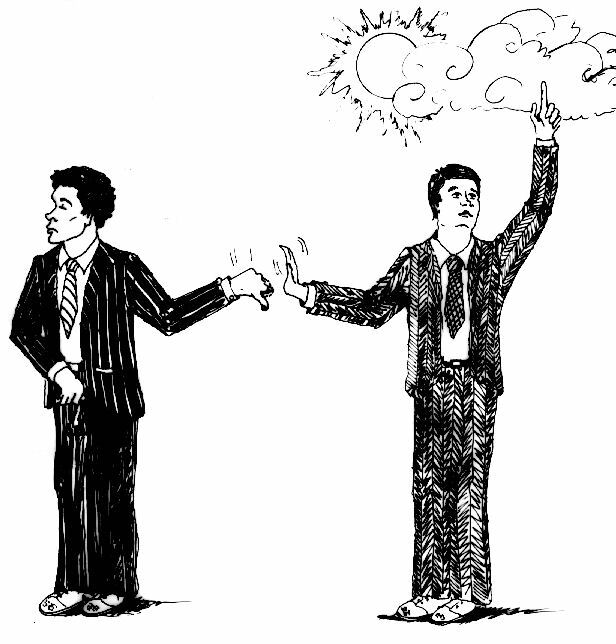 Conflicts of interest and forecasting just do not go together, Even if you do not deliberately put out false signals, if you are dependent upon selling that product or commodity, then it is as if you only have a hammer and everything appears to be a nail. 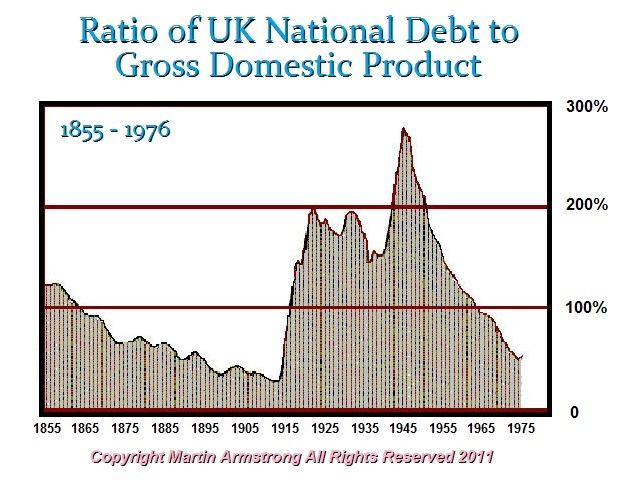 The British economy peaked in 1914. There was no hyperinflation thereafter despite the abandoning of the gold standard. So both the USA during the Civil War and Britain abandoned gold during war and neither entered into hyperinflation so it is true – fiat does not automatically create hyperinflation. Sorry. I believe in gold as an asset class. I do not believe in gold as the economic savior, exclusive form of money, or any other nonsense that cannot be demonstrated on a CONSISTENT basis in history. Today, we have come full circle. Money once again pays interest to hold it. 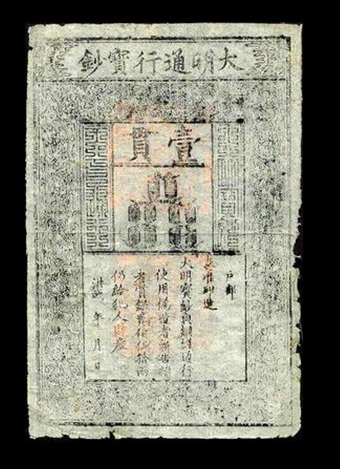 The term “Greenback” meant that it was neither backed by gold or did it pay interest as shown on this note with the schedule. You flipped it over and there was nothing but green ink. So the dollar is once again paying interest since you can use T-Bills and bonds as collateral – a derivative of circulating bonds as it began.